I dream of the day when I have my own office and my own business and no one telling me what to do. I know its going to take ALOT of work if I ever want to make it reality, but I already like to dream about what my future office will look like. I'm sure there is more of the list- but these are tops for now. Don't forget to enter the Perfect Summer Giveaway for a chance to win a beautiful dress from Shabby Apple. i agree - fantastic spaces! i'm haven' a party - stop by!!! Yes organization is the name of the game for me because I am moving and need some refreshing! Happy weekend! Those inspirational images are perfect!! 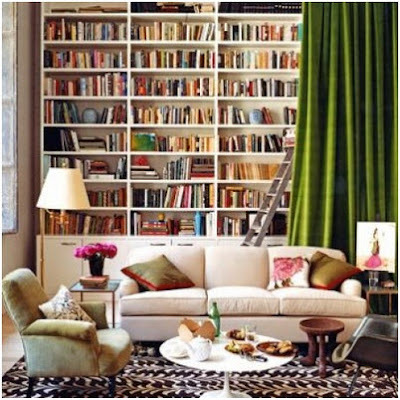 this is such a great mix of spaces and is totally what i envision as well! i'm about done with my desk area and hope to share it next week. let me know what you think! Good luck with it all! Do you work as a designer, for some reason I didnt think you were making a living as one? these are all such great spaces. i am feeling the same sentiment right now. i am working towards working for myself and just hoping that it all works out. it would be so fun --- and the potential is endless. xo! 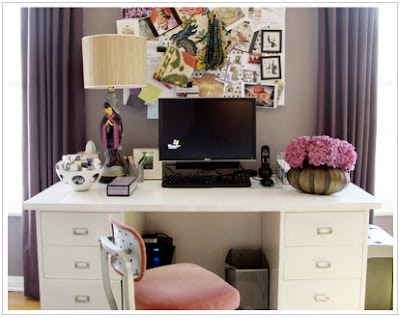 Oooh can I have an office like these too?! You put together some awesome spaces! Some of my faves. What a wonderful dream -- and those inspiration photos are beautiful! Absolutely love the lucite desk accessories and that light fixture in Suzanne's office...oh and Nate's wall-to-wall inspiration board! I love all of these images. I have a think for creative/office spaces. They end up being my favorite posts. This one is great. All these offices are beautiful. I want to redo mine! Everytime I see that photo with the big green drape over the bookshelves, my heart skips a beat! I love that picture. Thanks for answering! Good luck with school - it is so much work! I'm sure you will have your beautiful office one day! I was actually wondering because we are looking for a furniture maker/workroom in NYC. We have a new project there and were hoping a blogger/designer in the area may be able to help. If you know of any, I would love to hear from you! Have a good weekend! You're totally going to have an office as awesome as these! Wow, awesome and totally in the same sentence...ha. Don't you love offices? I think they're the most fun to design! There are all beautiful. I completely agree. I would love to have my own office, set my hours and be my own boss. Love the office pics! I am redoing mine right now and these have some great inspiration! just start.....you have a great eye for design! I've always loved green velvet drapes... if only I could find some in the perfect green on the cheap! such great inspiration! I am working on our home office area and needed a boost to get it done! Can I join you on the dreaming please Linds? Please? Always love that Nate Berkus room! 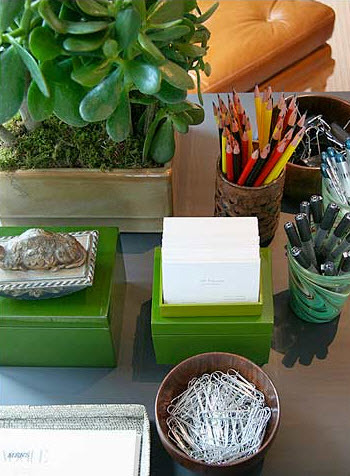 I can't get my hands on enough design books....and I'm a huge fan of pretty desk accessories!! I can't wait for the day when my office is outside of my house, I dream of it all the time. Love it all, let's office share. I'm just grateful that I have my own office with a door and a big window, and not a cubicle. But it sure would be nice if my little space were as pretty as those! Great inspiration! 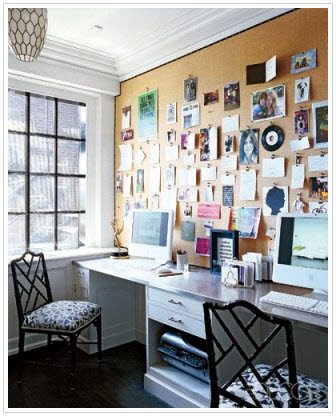 I love the wall with the huge inspiration board with the black trim, that's going in my favorite's file! First office is my fav! Love the natural texture of those baskets with the sleekness of the furniture! Oh ya! I too dream of having my own office and being my own boss... and all the time and hardwork will eventually pay off for us. Thank you for sharing all inspiring photos. The floral arrangements complete the looks! I love flowers and succulants. Great pictures....I am trying to convert our spare bedroom into my studio/workspace...and these pictures are sooo inspiring. I wish i could stay as organized as the top photo...with all of the baskets. I love that one...and the Lonny office. !